Want the 6 golden tickets that eliminate decades of guesswork, research and suffering, that lets you play some timeless blues guitar riffs and songs immediately? Are you interested in learning some of the most powerful, yet easy-to-use lost blues secrets that instantly catapult your guitar playing to the next dimension of power? Here's a personal factoid about me -- I love watching Kung Fu movies. No, I'm not a student of martial arts. However, it's somehow really exciting and cool to watch (even though it's obviously fake and stuff). And I really get into the mystique and the myth of all the various styles -- you know, like "dragon style", "tiger style", "drunken monkey style", etc. The names are cool as gunk. I read once that Kung Fu literally means "practice". And like in the martial arts, there's a huge variety of styles to learn and master. That's even more exciting to me. So while I was putting together this new package of DVDs from the old-time blues masters, I thought to myself... "Wow... These guys are kind of like the old Kung Fu Masters of the movies. They all have their own style, their own moves." I have no freaking clue if any of these blues legends could throw a punch -- what I do know is they knew to throw chords, slam songs, kickstart leads and flip a crowd into a frenzy. That's why I'm calling them "The 6 Kung Fu Blues Masters". And these masters are going to whip you into fighting shape on the guitar in record time. The true king of Texas Blues is Lightnin' Hopkins. You'll learn all the basics, and many of the secrets and tricks of the acoustic Texas boogie guitar style. Yes, you'll go right to the source of Texas blues and learn (lick by lick) from the master who inspired generations of guitar heroes. Several cool turnaround variations that you can apply to almost any blues... Yes, it is super-fun to enrich your "blues vocabulary" with slick variations. And speaking of variations, you'll get a bunch of easy-to-apply bass-note shuffle runs and guitar break riffs. Mix these up and create your own blues guitar magic. The art of the slow blues... It's all about using these tried and true shapes and voicings. Just follow along with the tabs and its as simple as eating Grandma's apple pie. 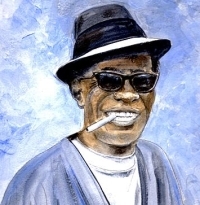 The true king of Texas Blues is Lightnin' Hopkins. In fact, he's in the top 100 greatest guitarists of all time according to Rolling Stone. His style was born from spending many hours playing informally without a backing band, and his distinctive fingerstyle playing often included playing bass, rhythm, lead, percussion, and vocals, all at the same time. It has been estimated that he recorded between 800 and 1000 songs during his career. For each song, you'll get several useful variations for the verse, the turnaround, and different guitar break ideas. These are powerful plug-and-play ideas that you can use immediately. Add some sweet blues tunes to your repertoire including: Pull a Party, Goin' Down Slow, Shining Moon, Baby Please Don't Go, and Take Me Back. 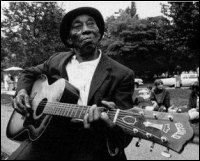 One of the all-time great Delta bluesmen...Mississippi John Hurt was famous for his fingerpicking style. How to play beautiful blues guitar using the alternating bass technique. Make masterful sounds using only a few basic chords. The magic is in the right hand! Again, the tabs make it straightforward to learn. Discover a treasure chest of blues, including 8 bar, 10 bar, and 12 bar arrangements in many different keys. Mississippi John Hurt had a universal appeal as a guitarist, and was one of the most influential country blues musicians. He played with fast, syncopated fingerpicking style that he taught himself. 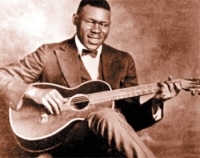 He recorded in the 1920s, but his rediscovery in the 1960s helped further the American folk music revival, which had led to the discovery of many other bluesmen of the era. Songs recorded by Hurt have been covered by Bob Dylan, Jerry Garcia, Beck, Doc Watson, and other household names. Soulful melodies and syncopated runs are the hallmark of this blues style, which you'll learn how to master in record time. Learn more great blues tunes like Spike Driver Blues, My Creole Belle, Monday Morning Blues, Slidin' Delta, See See Rider, Louis Collins, and Frankie. Furry Lewis was a superb guitar player with a rhythmic strength and fluency that was all his own. He was one of the greatest blues improvisers of all time. Learn his trademark "double up" beats that gets any crowd excited and riled up. You'll get both some impressively complex arrangements and also some really simple ones that you can use instantly. Pick and choose which pieces to learn, including some of the greatest country blues pieces ever. Discover tons of special techniques to make your bass runs strong, your thumbwork solid, and your fingerpicking flow. 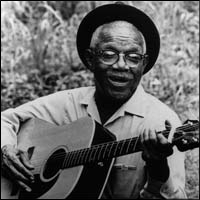 Furry Lewis was a songwriter and blues guitarist from Memphis, Tennessee, where he lived and performed for much of his life. Lewis was a stellar showman with a gift for superb guitar playing, improvisation, and storytelling. He sometimes fingerpicked, and sometimes played with a slide, and he recorded for several prominent lablels in the 20s. Later, the folk blues revival brought Furry out of retirement, and he went on to record more tracks in the 1960s. Before he died, Lewis opened twice for the Rolling Stones, and played on Johnny Carson's The Tonight Show. BOOM-SHAKA-LAKA! Cool broken chord riffs that create killer textures. Load up your arsenal with a large repertoire of legendary blues riffs. Dryland Blues, Mistreating Mama Blues, Billy Lyons and Stack O'Lee, I Will Turn Your Money Green, Kassie Jones, and Rock Island Blues. 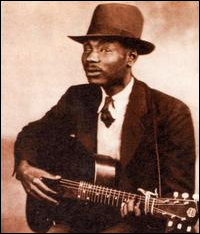 Blind Boy Fuller had a unique brand of country blues playing, which is chock full of wit and soulfulness. One of the most powerful blues guitarists of the 1930s. How to weave together different elements like chords, picking patterns, and chromatic slides. Easy to play, but powerfully effective single note runs. Funky old-school blues chords that will breathe new life into your playing. 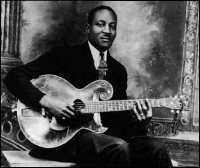 Blind Boy Fuller was an expressive vocalist and a masterful blues guitar player. He started out playing on street corners and house parties in North Carolina. After developing a following he recorded over 120 sides with the American Recording Company and become one of the most popular of the recorded east coast blues artists. He played a steel National resonator guitar, and was famous for his ability to fuse together elements of traditional and contemporary songs and reformulate them into his own performances, including many uptempo hits. You'll love these intense new blues songs: Untrue Blues,Jivin Woman Blues, Pistol Slapper Blues, Funny Feeling Blues, Meat Shakin' Woman, and Truckin' My Blues Away. Create amazing blues patterns by combining open strings and chord chunks. Loads of great ideas you can use to create your own blues riffs and songs including wide intervals, alternate chords, and more. Virtually unknown chord shapes that will blow your mind. Big Bill Broonzy was a prolific blues singer, songwriter and guitarist. His career began in the 1920s playing country blues. Through the 30s and 40s he played a more urban blues sound. In the 1950s, a return to his traditional folk-blues roots made him one of the leading figures of the emerging American folk music revival and an international star. His long and varied career marks him as one of the key figures in the development of blues music in the 20th century. Broonzy copyrighted more than 300 songs during his lifetime, including both adaptations of traditional folk songs and original blues songs. Big Bill gives you super simple single note runs that sound like a dream, as well as thick, juicy 1-man-band type arrangements. Add a whole slew of classic blues songs to your setlist, including Moppers Blues, Pig Meat Strut, Long Tail Mama, Hey Hey, Worried Man Blues, Saturday Night Rub, Brownskin Shuffle, How You Want It Done, Mississippi River Blues, and Worrying You Off My Mind. Blind Blake was a true Guitar God of his time. Maybe the most virtuosic guitarist of the bunch -- he had a killer alternating bass style, but supercharged it with more complex blues and rhythmic ideas. Unique right hand thumb rolls. More cool chordal structures that will expand your blues kung fu mastery. Blind Blake recorded about 80 tracks for Paramount Records between 1926 and 1932. He was one of the most accomplished guitarists of his genre with a surprisingly diverse range of material. He is best known for his distinct guitar sound that was comparable in sound and style to a ragtime piano, with complex and intricate finger picking. He is often called "The King of Ragtime Guitar", and he extended the alternating bass style, that was popular at the turn of the century, to encompass the dance trends and more complex blues and rhythmic ideas that were emerging from the jazz bands of New Orleans and Chicago. Well, this is it my friend... a rare chance to learn some legendary blues guitar secrets. An opportunity like this doesn't come along every day. Personally, I'd like to think that I've been wise enough in my life to seize the day and jump on a good deal when I see it. And I can't recommend enough the importance of investing in powerful information. So if you like blues guitar, then ordering these DVDs is a no-brainer decision. 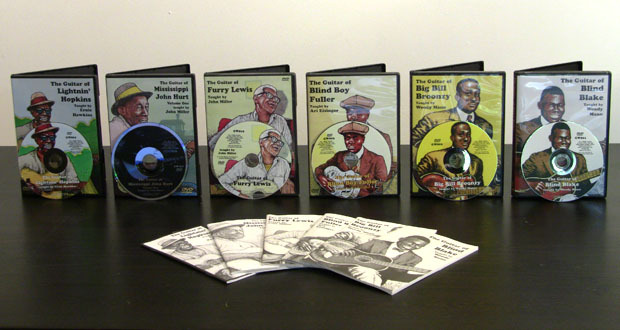 This is a beautiful DVD collection that will reward you for years and years with the rich history of the blues, great vintage footage, outstanding instruction, and more. We're talking about 9 hours of epic footage, and a lifetime of enjoyment. In addition to the 6 DVDs, each one comes with it's own booklet of tabs, showing you how to play every note. That makes it simple! Just follow along with the DVDs, play the notes as they're written, and the next thing you know, you'll be playing some legendary blues guitar. What else can I say? Can I possibly make it any easier for you to get some killer blues skills under your fingertips? Well, I want to make your decision a breeze and put these DVDs in your hands today... so let me tell you about our generous protection program that takes all the risk out of this deal. This is an amazing opportunity to invest in yourself and your musical education with some of the most unique and powerful blues guitar lessons ever captured on DVD. Even by DVDs standards, this 6 DVD set is easily worth $300 ($50 a DVD). But you wont pay $300. You won't even pay $200. I've managed to get the price down to a low, low $177 $127 and I'll even include free shipping. Just click to the next page, fill out your information, and I'll rush your order right to your door, anywhere in the world. Don't forget you're getting 6 jam-packed DVDs and 230 pages of tabs! It's a no-brainer decision, so please click on the link below, fill out your information, and you'll soon be the proud owner of The Deep Delta Blues Guitar Course that will reward you for a lifetime. P.S. Remember -- you're going to learn from 6 of the late, great blues masters of all times -- and own some of the most powerful forgotten lost blues secrets of all times. This includes: 230 pages of tabs, 6 DVDs and 9 hours of footage. It's a dream deal for any blues fan. P.P.S. 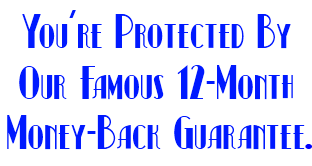 And don't forget you're protected by our 1 year unconditional money back guarantee. If this package isn't everything I say it is, or you're not totally thrilled, I insist you ask me for your money back. There's nothing to lose and tons of blues chops to gain.